The Berks-Schuylkill Oil Heat Association exists to promote and educate current and prospective heating oil customers as to the benefits of oil heat and to support local oil companies, providing a wide range of products and services to enhance their customers' satisfaction. The Berks-Schuylkill Oil Heat Association has strong ties in Berks and Schuylkill Counties as well as some surrounding counties. It is dedicated to serving the needs of the public as well as the industry. he Berks-Schuylkill Oil Heat Association is a proud sponsor of the Reading Fightin Phils. Providing family-friendly entertainment since 1967, the Philadelphia Phillies' minor league team is one of Reading's main attractions and one of the many benefits of living and working in this community. The Berks-Schuylkill Oil Heat Association is also proud sponsor of the Reading Royals. The Royals are a professional ice hockey team that currently plays their home games at the Santander Arena located in downtown Reading. The Royals serve in the farm system for the Philadelphia Flyers of the NHL. Since 2001, the Royals have ranked among ECHL leaders in regular season attendance thanks to the local fans. The Berks-Schuylkill Oil Heat Association supports local athletics as well. The T-102 Game of the Week is a great platform to showcase local athletes and their schools. The Berks-Schuylkill Oil Heat Association is proud to work with T-102 and sponsor The Game of the Week, each week during the fall football season. We are also pleased to sponsor the Salvation Army in both Berks and Schuylkill Counties. In the past 6-years, BSOHA members have generated nearly $25,000 to help the heating needs of the less fortunate. Our support for the non-profit organization that boasts the motto of "doing the most good" for those who need assistance strengthens our commitment to serving the Berks and Schuylkill County communities. 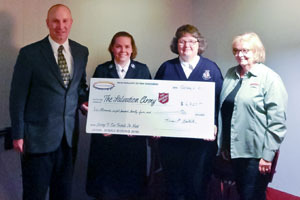 The Berks-Schuylkill Oil Heat Association (BSOHA) donated $6,825 to both the Berks and Schuylkill County Salvation Army Corps on Thursday, February 21, 2013 with each Corps receiving half of the total donation. This is the largest donation BSOHA has ever made to the Salvation Army SHARE Program. During the past 11 years, the BSOHA annual charitable donation has directly helped the heating needs of area residents to a total contribution of $55,465. Captain Tammy Hench and Ms. Mary Metzger of the Schuylkill County Salvation Army as well as Ms. Mindy McCormick and Major Colin DeVault of the Berks County Corp were on hand to accept the presentation from BSOHA President Kevin Steele of H.B. Steele & Son, Inc., Orwigsburg and BSOHA Secretary/Treasurer, Karen Bostard of Hafer Petroleum Equipment, Ltd. Reading. "We were very pleased to be able to make the largest annual donation to the Salvation Army that BSOHA has since the fundraisers inception. Our donation was $1,275 more than last year. I am very pleased with the charity of our membership and rising to the occasion in these tough economic times," stated Kevin Steele President of BSOHA. Donations for the annual fundraiser were received from the following member companies of BSOHA: Boston Environmental, Buckeye Energy Services, BRT Inc., Earl R. Martin Inc., Elite Fuel Services LLC, Elk Environmental Services, Global Companies LLC, Hafer Petroleum Equipment Ltd., H.B. Steele & Son Inc., Jack Rich Inc., Keller Oil, Kintzer Fuels and Petroleum Products Corporation. As an organization comprised of independent heating oil distributors and dealers, and associated industries, The Berks-Schuylkill Oil Heat Association exists to promote and educate current and prospective heating oil customers as to the benefits of Oil Heat and to support local oil companies, providing a wide range of products and services to enhance their customers' satisfaction. The Salvation Army is an evangelical part of the universal Christian Church with its own distinctive governance and practice. Its doctrine follows the mainstream of Christian belief and its articles of faith emphasize God's saving purposes. To learn more about the Salvation Army log onto www.salvationarmy.org. "Thank you for the wonderful dinner, fellowship, and kind donation. 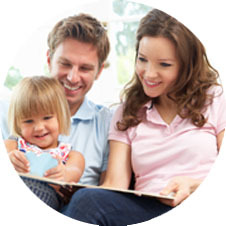 This is always a true blessing and helps us to help many more families in need."